How Are You Promoting Your Business – the Old Standby Methods or Utilizing New Technology? As the economy continues to be a major factor affecting the ways in which small businesses promote themselves and go about the business of obtaining new customers, we at Strategic Growth Concepts have also found ourselves seeking new, higher impact, more cost-effective ways of promoting our business to prospective clients, as well as ways to help our clients promote their businesses. Our interactions with our clients and those in our many networks tell us that most small businesses are also interested in learning all they can to make the most of these new marketing and advertising tools. Therefore, we thought we would conduct a brief study to determine the methods of marketing and advertising currently being used by small businesses, as well as to determine which methods are being explored. We will use this information to develop a series of articles and radio shows to help small businesses review and evaluate the marketing and advertising options available to them, and to assist in their determination of which methods will work best for their business. Click HERE to take survey. We will share the survey results, as well as information about the various marketing methods, in upcoming articles and broadcasts. In the meantime, we would love to receive your comments in response to this article with your thoughts about the results various forms of marketing have produced for your firm. One area of importance that is often overlooked by small business owners with too much on their plate, is Market Research – to get a good grasp of their competitors, their target customers, their geographic market areas, and their industry. As a result, many small business are operating in the dark – functioning on the ‘gut instinct’ of small business owners or their staff. While that may work for a period of time, pretty quickly it becomes evident that you don’t know enough about what your competitors are doing, who exactly your most profitable customers are, and where exactly you can find those most profitable customers. Having such information can help a cash-strapped small business owner specifically target potential customers that are most likely to be interested in his product or service, and to keep costs manageable since you won’t be spending money directing advertising/marketing efforts to groups that are unlikely to have interest in what you have to offer. Knowledge of your market area allows you to know exactly where to find those highly profitable customers. Being aware of what your competitors are doing allows you to find opportunities they may be missing and take advantage of them, and Industry knowledge allows you to insure that your company is ‘keeping up’ and that consumers needs will be met by the use of your product or service – as well as ways others in your industry are approaching their customers. We at Strategic Growth Concepts are strong proponents of utilizing cost-effective ways to conduct Market Research to enable small businesses to gain every advantage possible. We have developed a variety of tools to enable small businesses to capture the information they need, and are always available to assist you in this endeavor. Should you have interest in learning ways that Market Research can help you more cost-effectively market your business, please contact us via our website or via email at info@StrategicGrowthConcepts.com. In the meantime, please read the article below from Forbes for some excellent information and resources. Free data? It’s out there, if you know where to look. Small business owners can be forgiven for shying away from projects without an immediate payoff. Cash is tight, customers are hurting and the future is uncertain. Still, when it comes to understanding your customer base, the education process can’t stop. Tastes change, markets morph. If you rely on the same dusty old data that once anchored your business plan, you’re finished–maybe not tomorrow, or three months from now, but soon enough. I’ll grant you that the returns on continuing market research are hard to measure, another reason that task gets pushed to the back of the line. The good news is that there’s a wealth of free information out there for those willing to pound a few hundred key strokes to find it. This topic is so important that I will be dedicating two columns to it. This first one focuses on actionable data–the kind that you can truly put to work, as opposed to the stuff that’s merely “nice to have”–and where to find some of it for free. We’ll discuss the stuff you pay for (but not too much) in the next column. Demographics. You can’t sell to people if you don’t know who they are, where they live and how much they have to spend. Demographics determine how to spend precious marketing dollars–for lists, advertising, direct mail, keyword testing (for online campaigns), and on and on. I learned this lesson back in 2005 when I launched a new cash-flow-based loan product. I simply didn’t know which customers would be likely to leap at these loans. After a number of months and many thousands of wasted marketing dollars, we surveyed our new customer base and revised our original profile (turned out our core base were not just “wealthy households,” but more specifically, self-employed small businesspeople at least 45 years of age). Understanding those demographics honed my marketing strategy and boosted the return on those efforts. Measurable preferences for specific product attributes. You can’t offer every bell and whistle. You have to know what matters most to customers. When Allstate markets auto insurance, it picks one benefit to emphasize, such as “accident forgiveness.” In a separate ad it might focus on “peace of mind.” Each effort is targeted, not cluttered with a kitchen-sinkful of selling points. You need to know which benefits will resonate with your customers. Good research that answers that question is crucial to performance. Behavioral trends. Once you know who your buyer is and what they want, you then have to know how they like to buy it. Younger people tend to be more comfortable buying product and service online, for instance, while older folks still appreciate personal interaction with a salesperson. Conclusion: If you target Generation Y, you had better have a killer Web site, a presence on social networks, etc. If most of your customers use Twitter, you better use it too. Now that you know what you’re looking for, how to find it for free? Step one: Cast a wide net. Start searching the Web by name of industry and add qualifying terms like “market size” or “competition.” (Remember to put quotes around multi-word phrases.) Don’t just use Google; tap other search engines, including outliers like www.cuil.com and Microsoft‘s new www.bing.com. You’ll be surprised how different the results are. Step two: Check government databases. The portal www.fedstats.gov is the gateway to multiple federal data sources brimming with demographic data. The mother lode, of course, comes from the Census Bureau, which presents detailed population and housing data, such as place of birth, education, employment status, income, value and age of housing units. The full data set, compiled every 10 years, is getting a bit long in the tooth, but to find specific neighborhoods that match your desired profile, it can’t be beat. The Bureau of Labor Statistics has gobs of useful stuff, too. Thinking about selling frozen filet mignon through the mail and want to know how much the average household earning at least $150,000 spends on beef? Check out the BLS “Consumer Expenditure Survey.” (The answer is $339 a year, by the way.) Just choose the demographic category most relevant to your product or service. You can also access regional breakdowns under the “Geography” tab in the left-hand navigation bar on the main page. Step Three: Mine the trade associations. Some associations are better data trackers than others, but be sure to browse what they do have. I’ve used information compiled by the Yellow Pages Association to advise my clients on the relative merits of advertising in print or online Yellow Pages. The bottom line about market research: It takes time and tenacity, so get to it. And I’ll be back in a bit to tell you what information is worth paying for–and what isn’t. A few years ago, using the Internet to market a small business simply meant to create a presence online with a simple, informational Web site. Then came the demands of search engine optimization to ensure Google and Yahoo searches yielded top-ranked results for your company. Today, social media is transforming the small-business marketing landscape. Social media are Web- or mobile-based tools for sharing and discussing information. It’s not just for seeing who your high school sweetheart married. Businesses can tap into powerful networking sites and other social media to drive customers to their shops or companies. If done right, small-business owners might even be able to slash their traditional marketing spending to zero. Read how by clicking HERE. Marketing your firm doesn’t just “happen”, not if you’re going to be effective at it. You need to identify goals, develop a strategy (based on the goals, the market, the industry, consumer knowledge and your available budget), plan the most cost-efficient and effective ways to implement that strategy, and put in place methods of tracking and analyzing the results of your marketing strategies. Those that refuse to “get out from behind the counter” or “get out from behind the desk” and expect customers just to show up are doomed to find themselves in that large percentage of small businesses that fail. You can avoid this by analyzing your business to determine who are your most profitable ‘types’ of customers, conduct research on your market area to determine where similar ‘types’ of customers can be located, identify the best methods of reaching those ‘types’ of customers, and then using that information to implement strategies designed to attract those customers to your business. The above tasks can be conducted independently by small business owners who will put in the time necessary, or they can bring in outside consultants to assist with parts of it or all of it. Remember – the more time you invest, the less money you have to invest! Marketing doesn’t have to be expensive – especially today with the many new resources being provided by social media and mobile technology – but it still requires work to put the marketing in place in a way that will be effective. Be a smart business owner – be realistic about the resources (time and/or money) that are needed to market your business effectively. If you’re convinced that you just can’t put in the time yourself, please contact us at Strategic Growth Concepts to assist you. We can be reached via our website or via email at info@StrategicGrowthConcepts.com to schedule an appointment for a FREE consultation. Detroit-based small business consulting firm, Strategic Growth Concepts, announces the winners of its first annual ‘Small Business Marketing Plan Give-a-way Contest’ held in support of the U.S. Small Business Administration’s National Small Business Week celebration taking place from May 17th thru 23rd. Read the full news release HERE. As we have become more and more technology-oriented in recent years, one of the trends I’ve noticed is that small business owners seem to assume that any task needing to be done to run their business requires a software package to facilitate it. Customer Relationship Management is no different. The multitude of CRM software packages available today, such as ACT, Outlook Contact Manager, Salesforce.com, SugarCRM, FreeCRM, SalesBoom.com and many others, have encouraged this trend. Unfortunately, what frequently occurs is that the programs are so complicated, or so work-intensive, that the already over-worked small business owners eventually stop using them; and then assume that they can’t proceed with a CRM program since they don’t have time to manage it with the software program. A database of your customers, in Excel, that can be sorted and updated and includes a comments section. Follow-up steps, including “Thanks for your time/business” letters or e-mails. 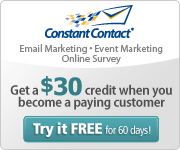 An inexpensive e-mail vendor such as ConstantContact, SwiftPages or any other similar online service that can cost as little as $15 per month to manage up to 500 contacts. A solid communication schedule, with a customer feedback loop that captures and logs in the customer contact history. Buy-in from every employee in your company to execute the strategy. The list of basic tasks above comes from an article that recently ran in Forbes.com that discussed CRM from a similar standpoint (the complete article can be found on our website), the premise being that CRM programs don’t need to be complicated to implement to be effective. Nor do they need to be costly or time-consuming. Make a plan, have a basic database to track your efforts, some simple tools, and you’re on your way to increasing business from the most cost-effective and profitable customers you can have – the ones who already know you and have done business with you. Try it and see if it doesn’t have positive impact on your business!